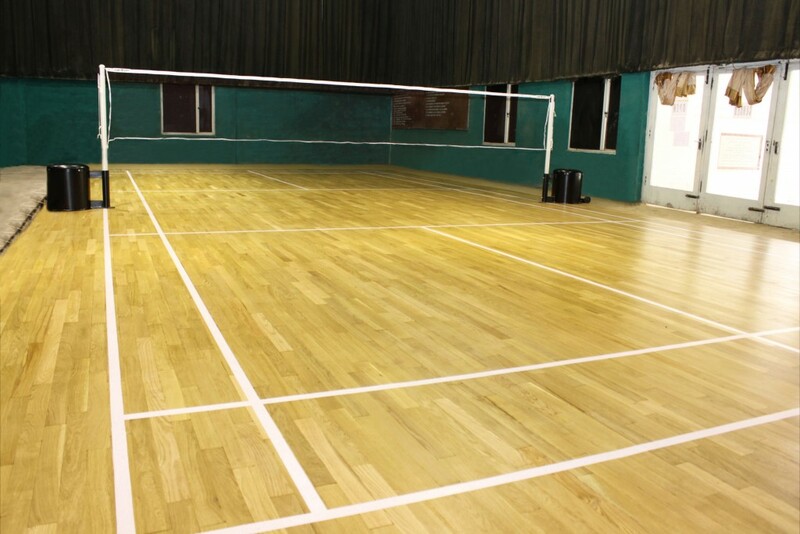 Air Cushion Wooden Flooring is a safe and injury free sports flooring with an excellent and consistent resiliency, friction and ball bounce. 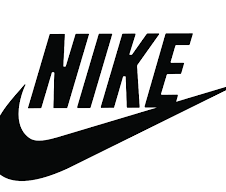 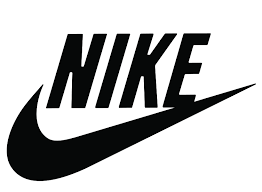 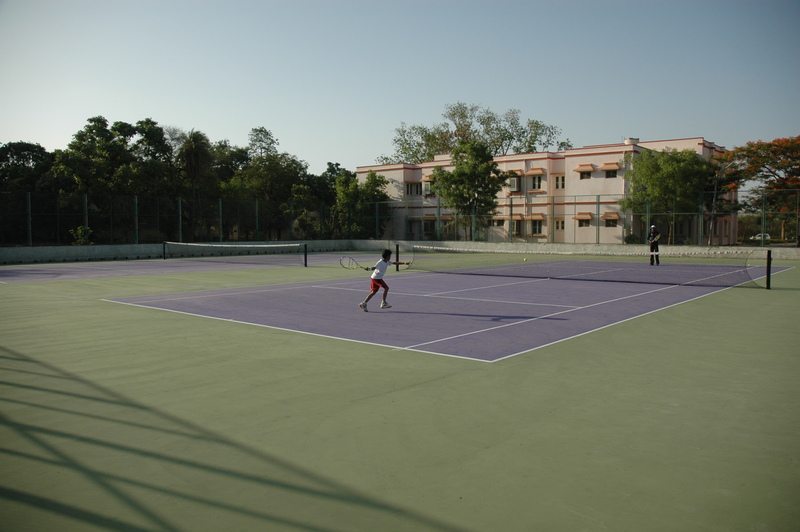 It is designed to nullify injury impact on various parts of a human body. 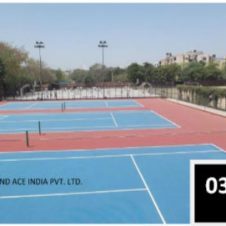 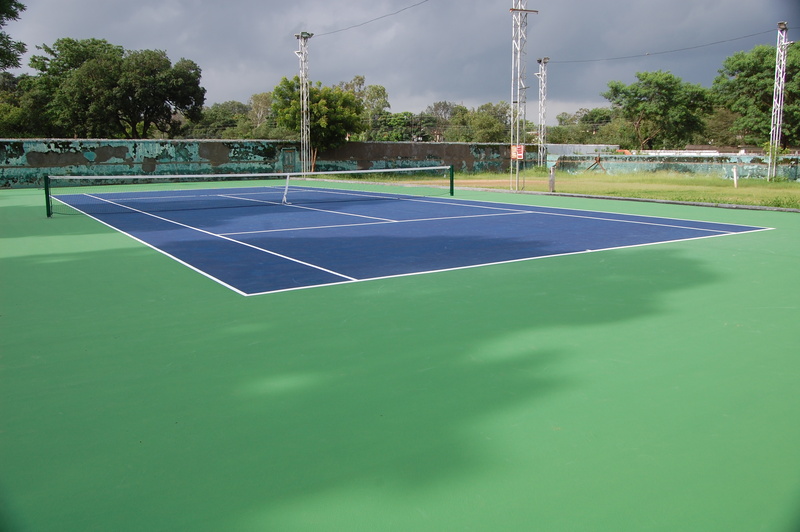 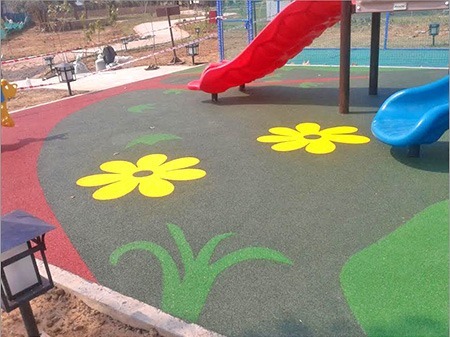 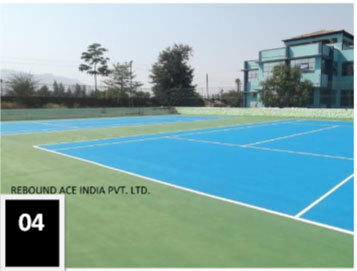 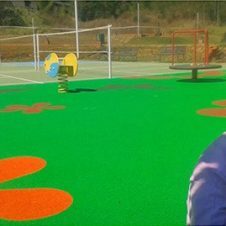 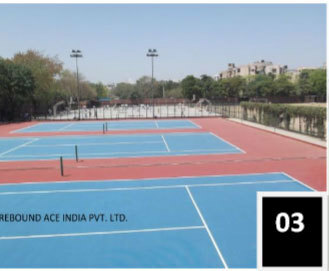 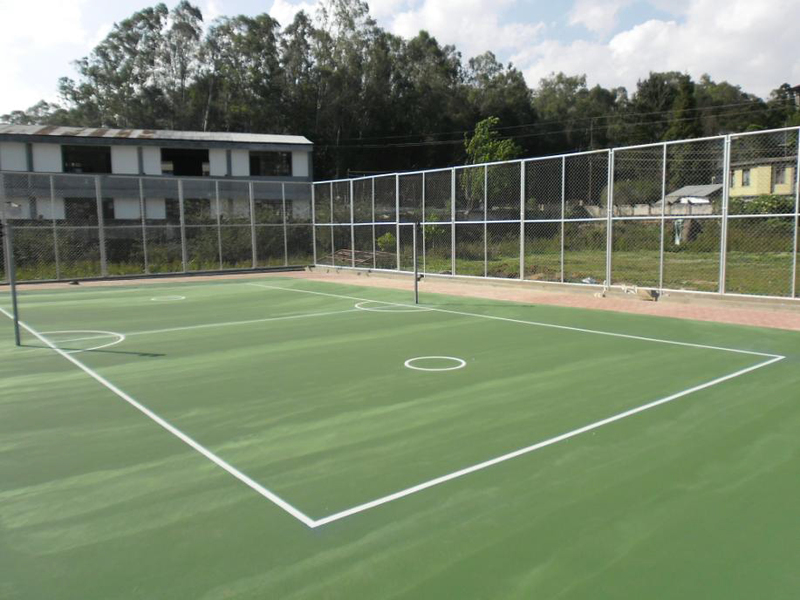 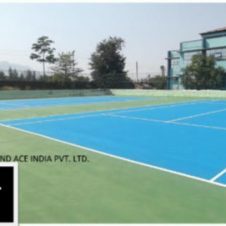 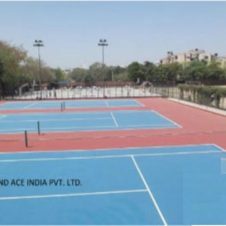 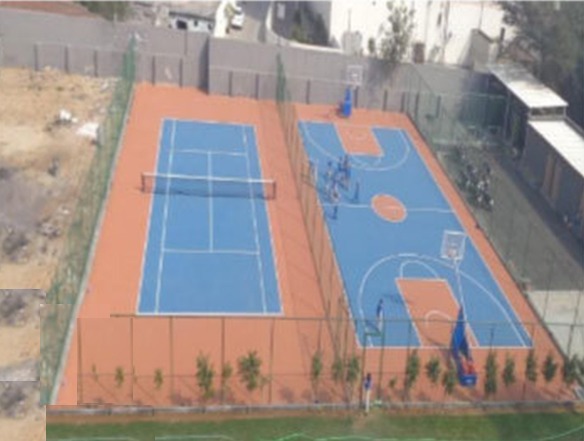 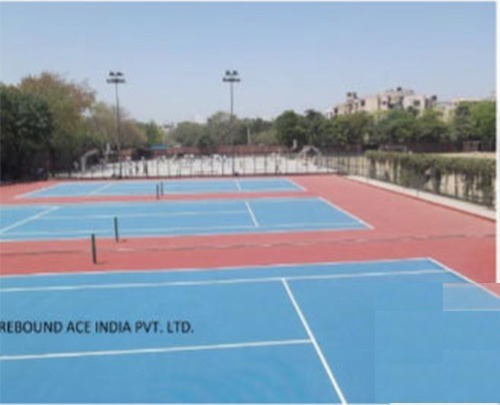 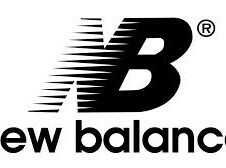 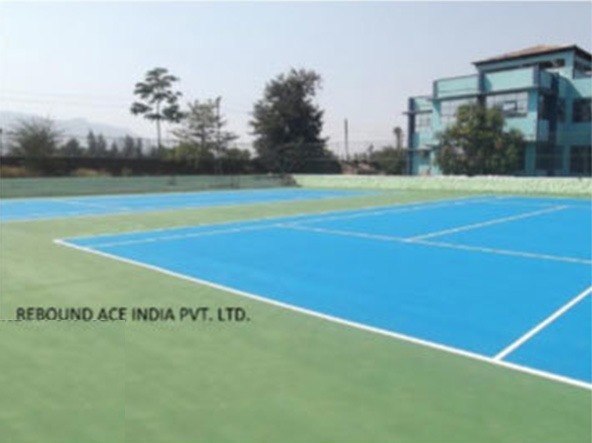 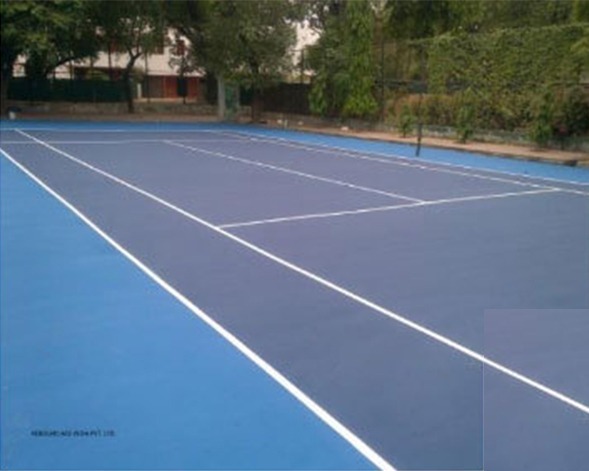 It meets all the requirements laid down by respective International Agencies/Bodies/Federations, for various kinds of sports surfaces in respect to shock absorption, energy consumption, ball bounce, restitution and stability. 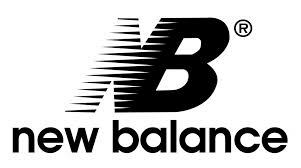 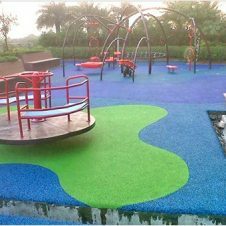 It also provides an optimal balance between friction and slide, which is necessary to improve performance and enhance comfort. 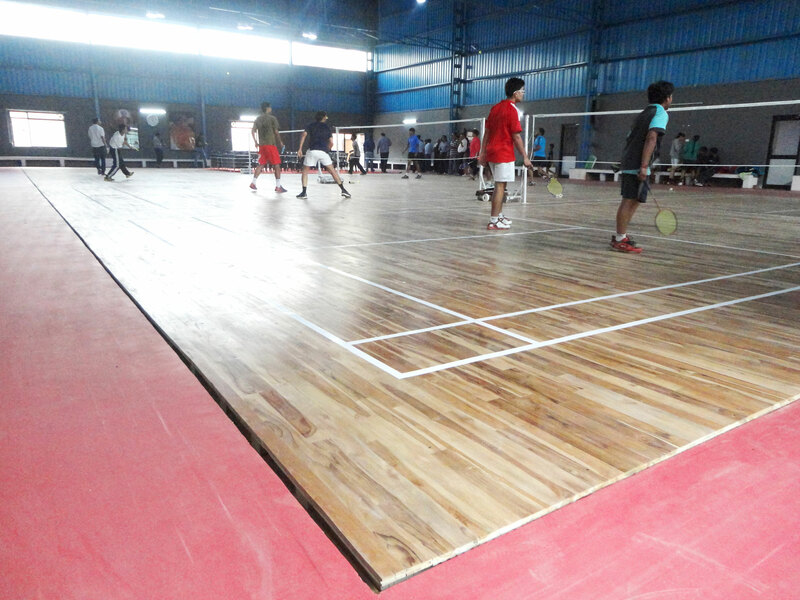 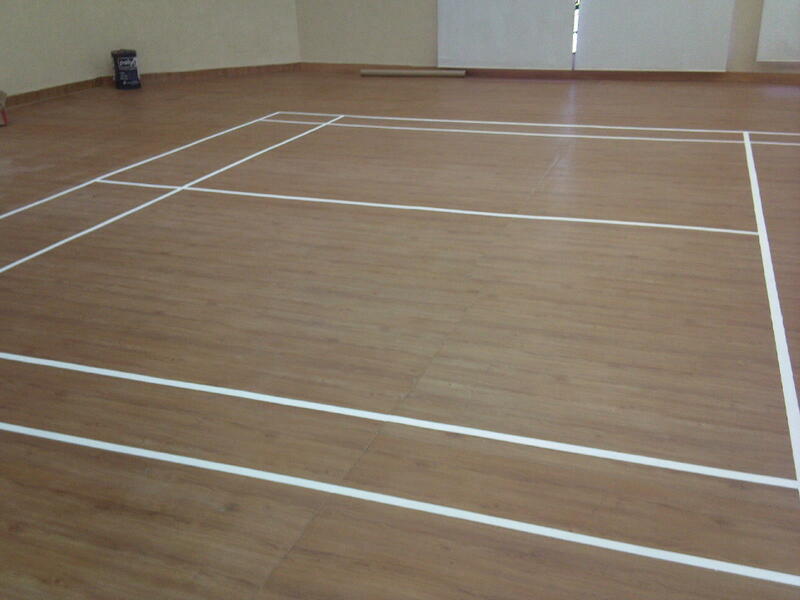 Players of all levels and age find comfort and safety in our wooden flooring systems. 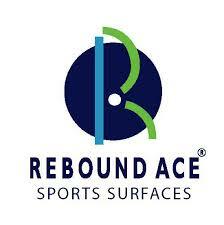 Our shock absorbing rubber pads protect the body from injuries, wear and tear, fatigue and help in extending playing careers. 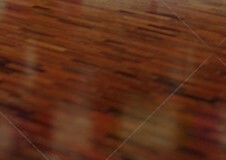 The flooring tiles are produced from Imported Maple / White Oak logs. 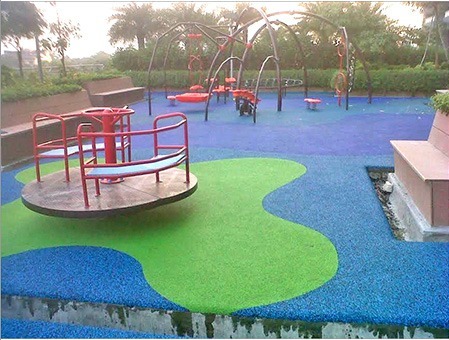 We do not risk the quality standards we maintain. These wooden species have been internationally recognized / accepted by respective sports governing bodies and are selected for its exceptional strength, durability and high resistance to wear and tear. 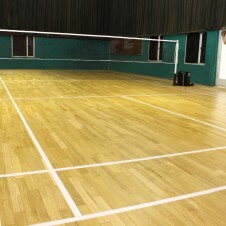 The wood is kiln seasoned/dried and pressure treated with anti termite chemicals in dosed vessels. 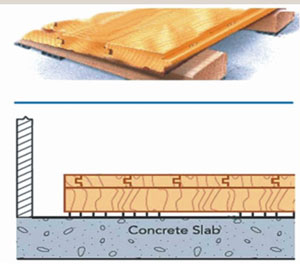 Proper care is taken to minimize the risk of contraction & expansion, which is a natural characteristic of natural wood. 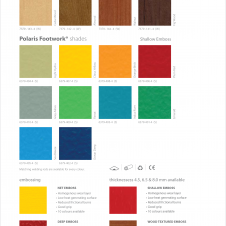 The floor boards are specially machined to a tongue and groove design for concealed joints. 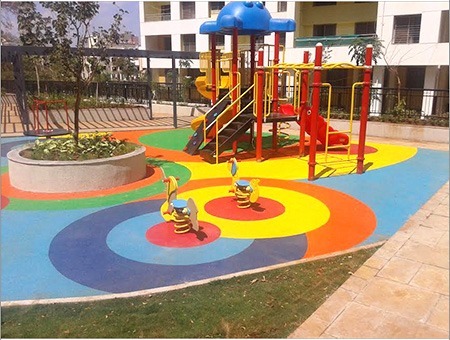 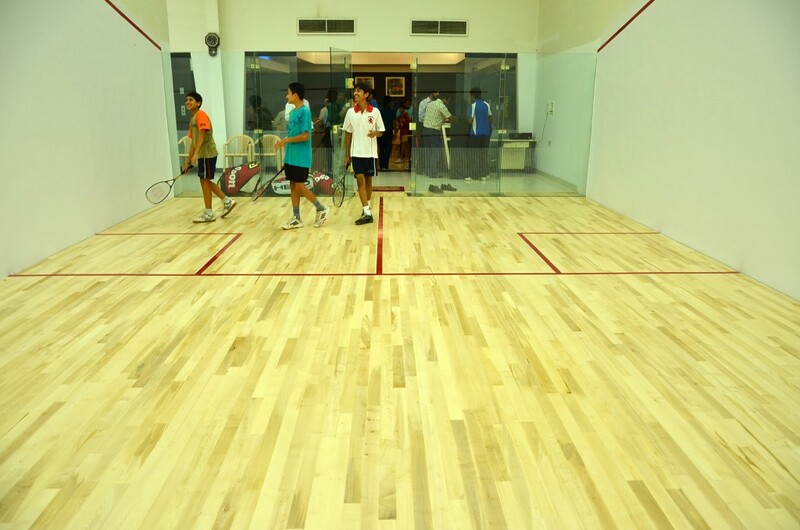 Our flooring is resistant to wear and tear which can happen with vigorous and extensive use by the players. 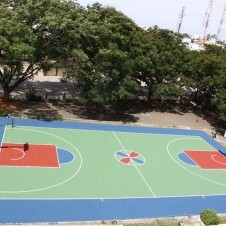 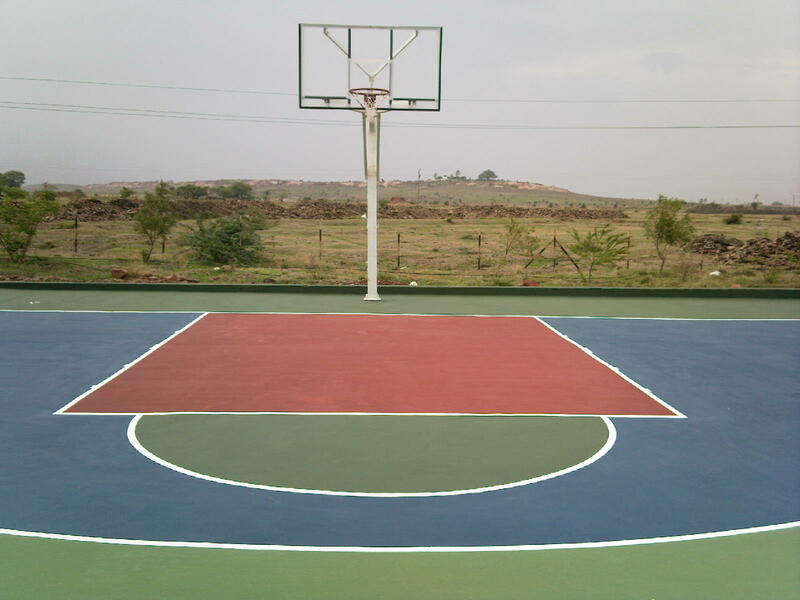 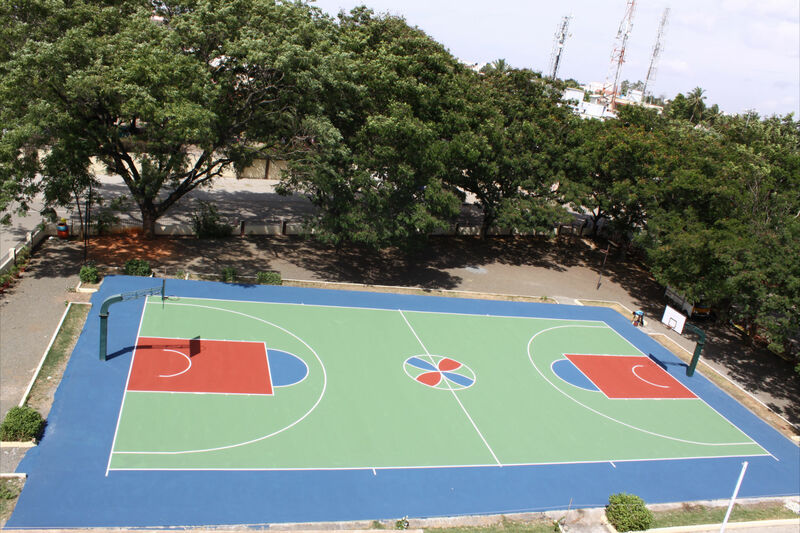 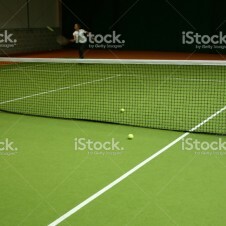 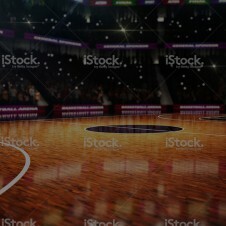 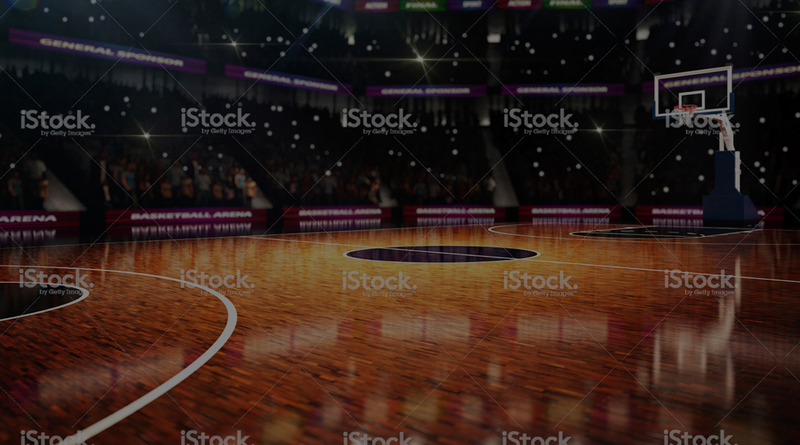 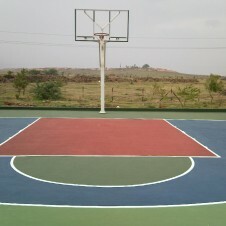 Selection and use of uniform color floor tiles ensure clear and equal visibility of ball while playing. 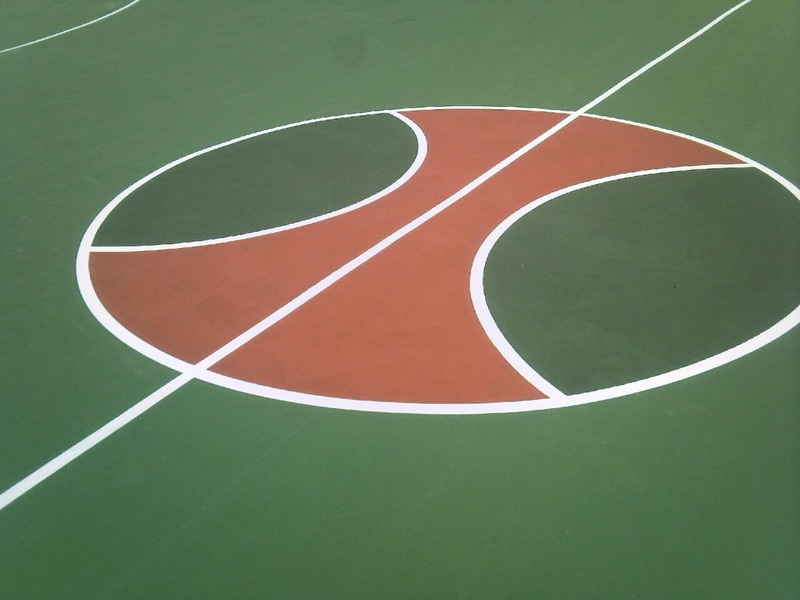 Stains and dirt can be effectively cleaned with basic care. 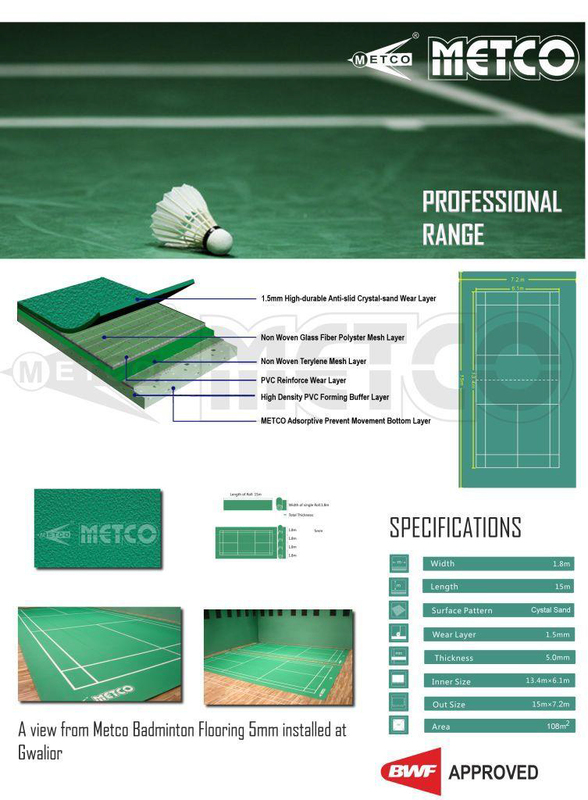 The International Standards and Specifications are strictly adhered to. 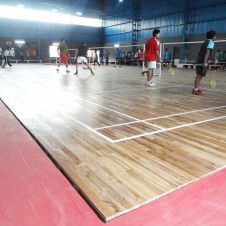 After completion of the civil construction, we undertake to lay out the Air-Cush Wooden Flooring system wherein we use Kiln Dried Imported White Oak, Maple wood Surface Board and the Base Frame of Imported Pine wood. 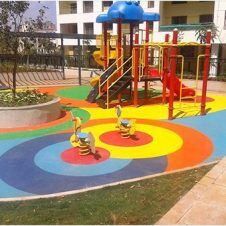 The Bona Anti- Skid Polish coatings used is DIN certified. 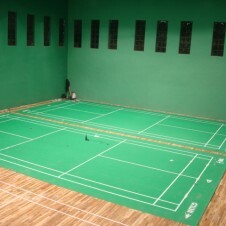 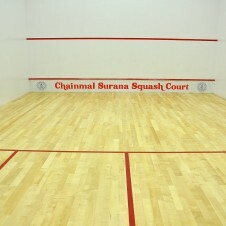 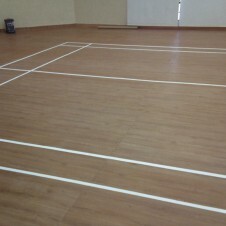 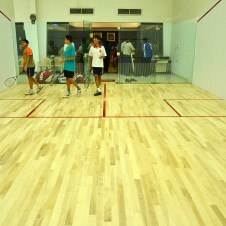 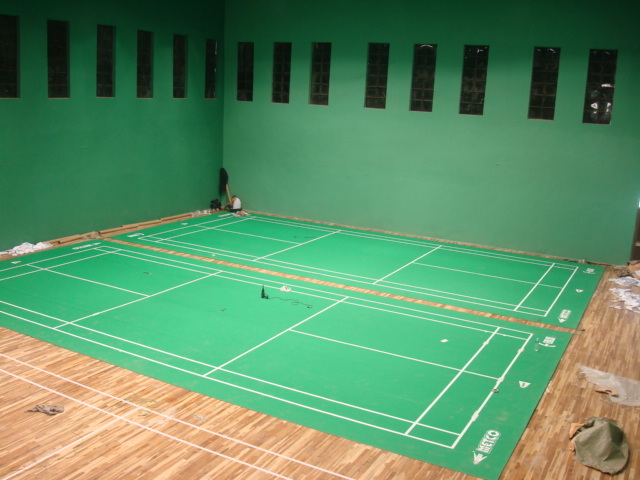 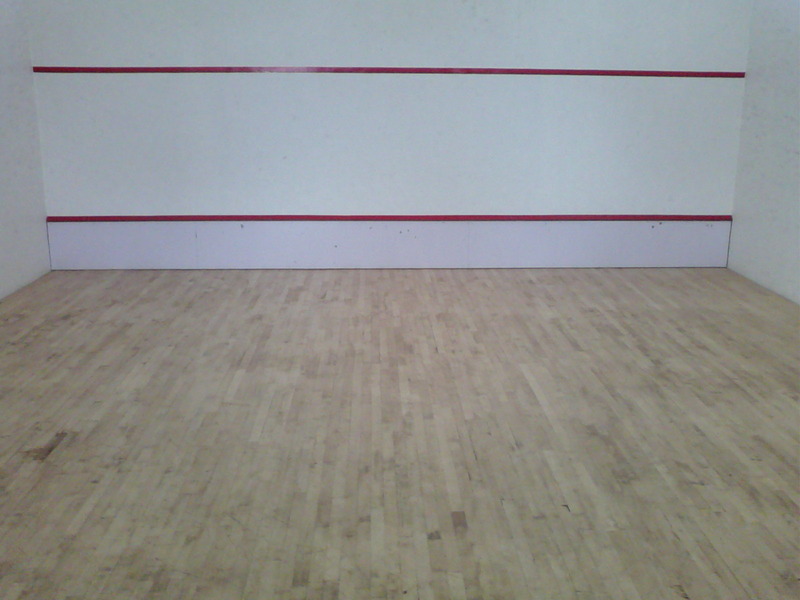 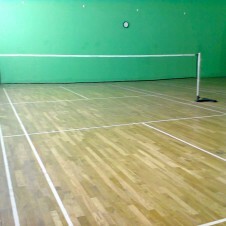 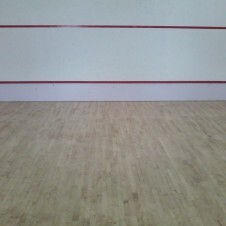 Air-Cushion on Wooden Sports Flooring system, confirming the requirement of WSF (World Squash Federation), consists of Kiln Seasoned/Dried Imported American Hard Maple or European Sycamore wood surface board and the under frame made of Imported Fir/Spruce/ Pine wood runners from New Zealand/Australia or Germany. 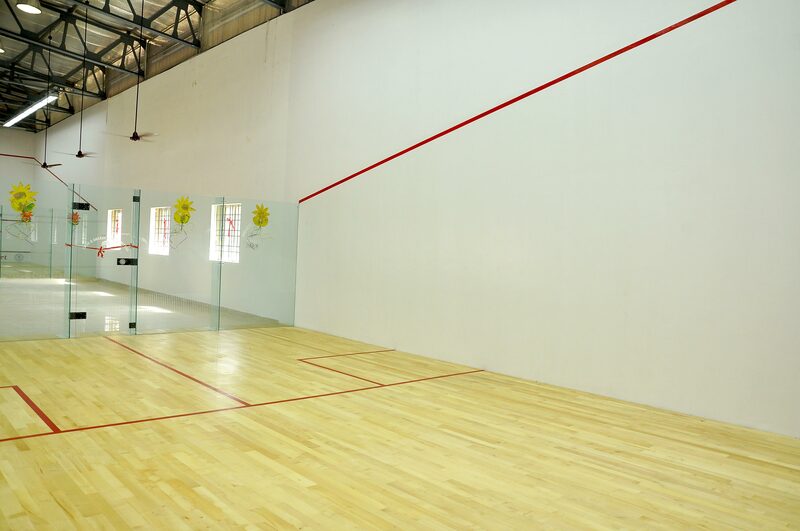 Exhaustively tested by leading competent authorities, Glass Wall System meets all recommended safety standards and building codes. 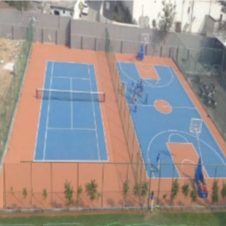 The design, manufacture and installation of all components are rigorously controlled and guarantees that repeated high energy impacts can be withstood without breakage whilst still providing an ideal court wall. 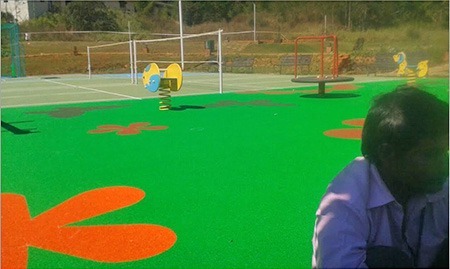 The unique door hinge completely eliminates the risk of finger trap. 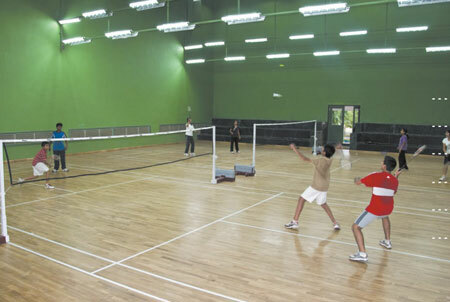 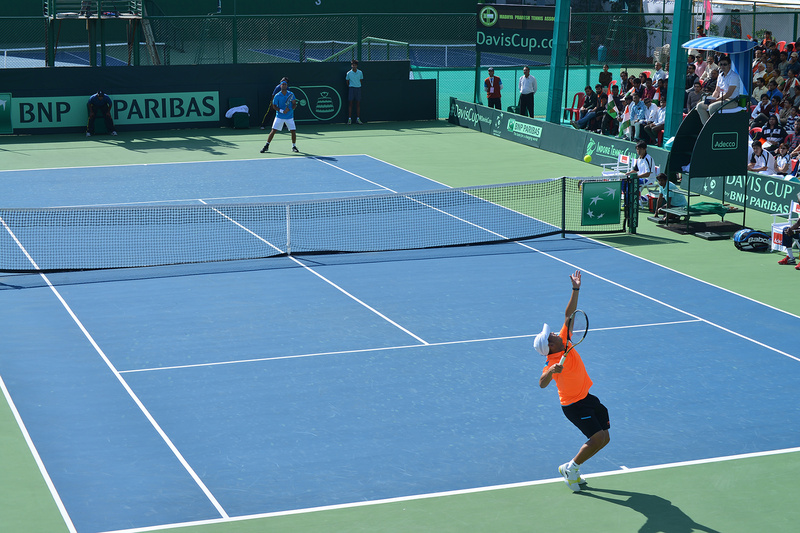 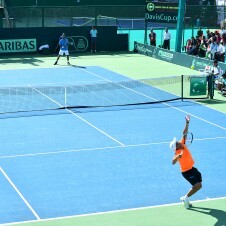 The glass walls give spectators a clear unimpeded view of the action on court which also helps in coaching and a good view for the referee. 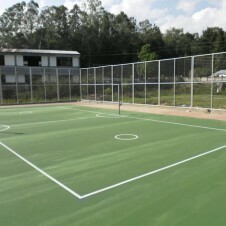 The material used is wholly compatible with 12 mm toughened glass and able to cope with the constant stresses applied. 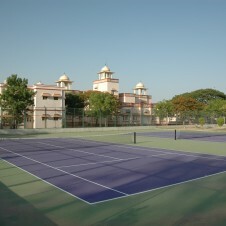 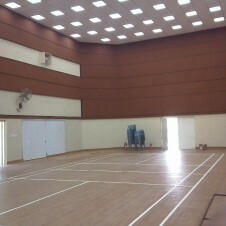 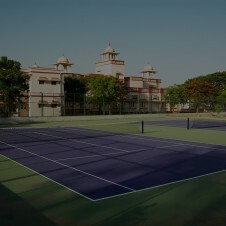 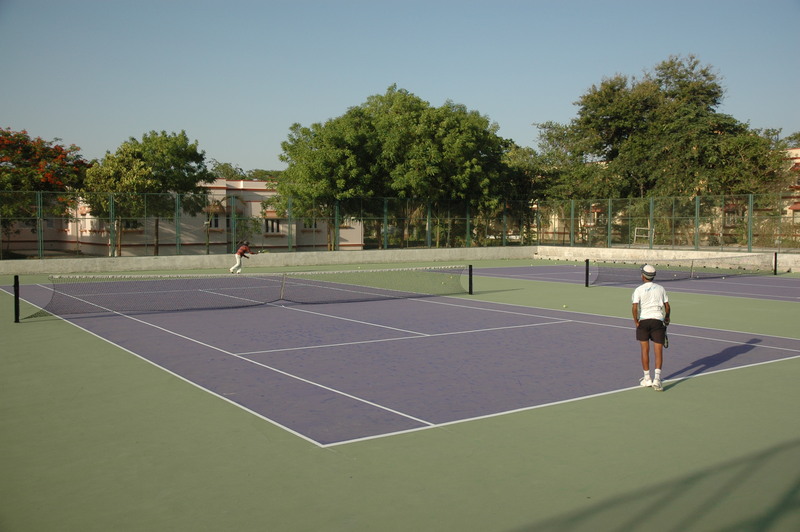 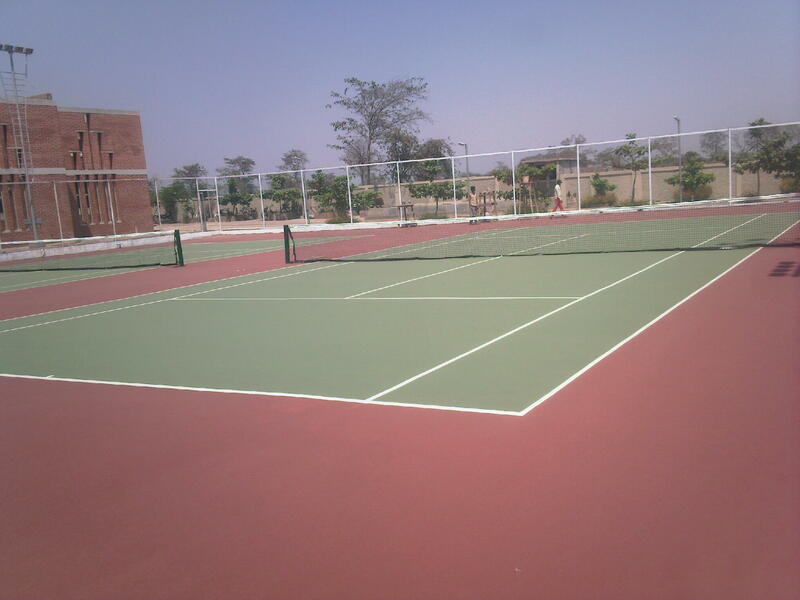 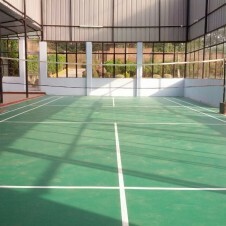 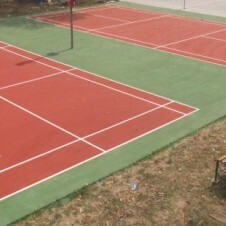 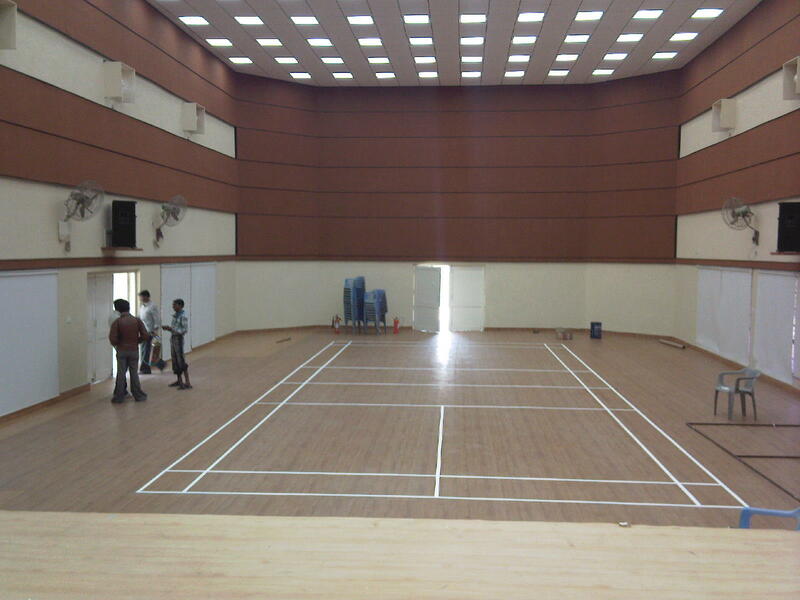 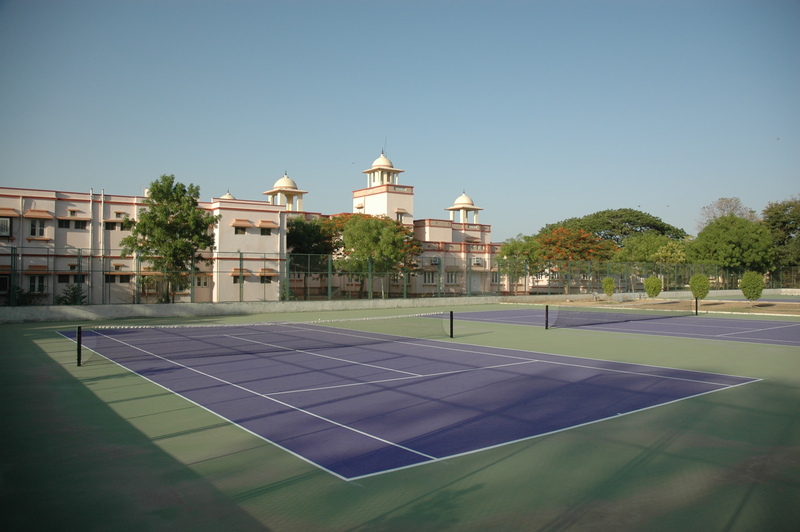 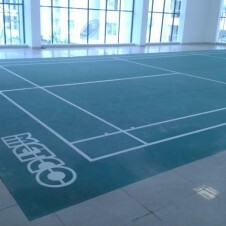 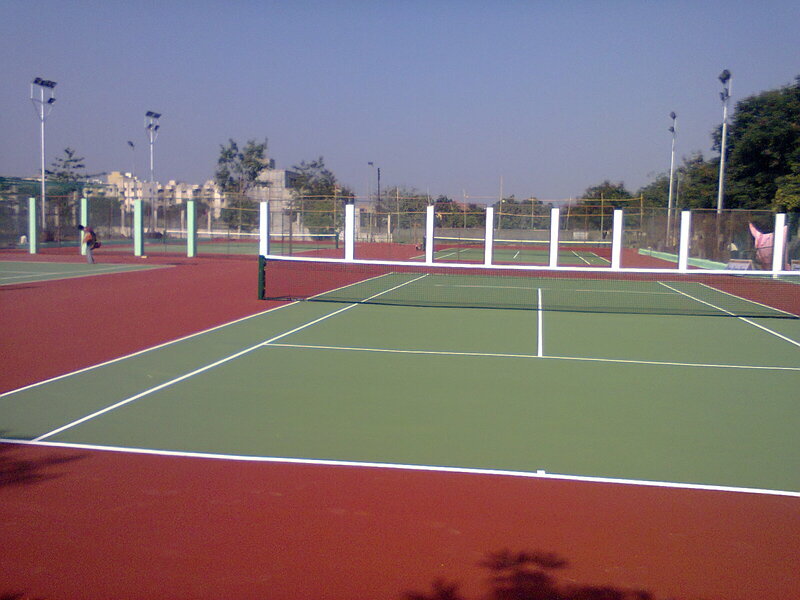 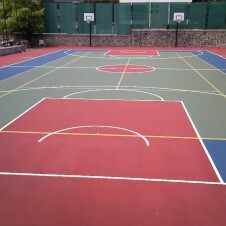 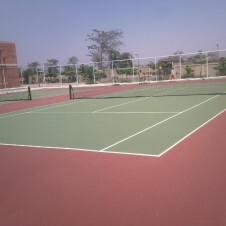 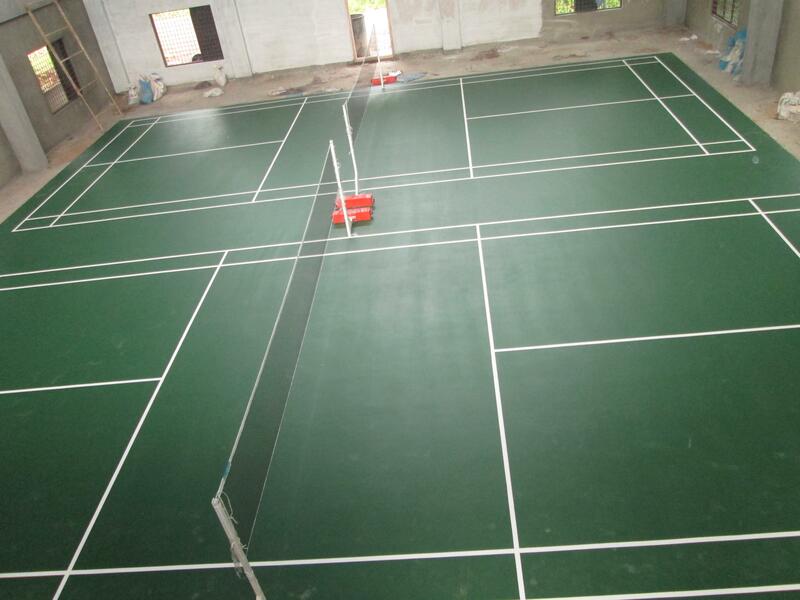 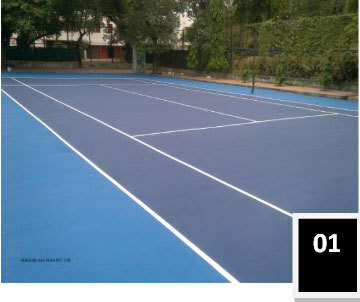 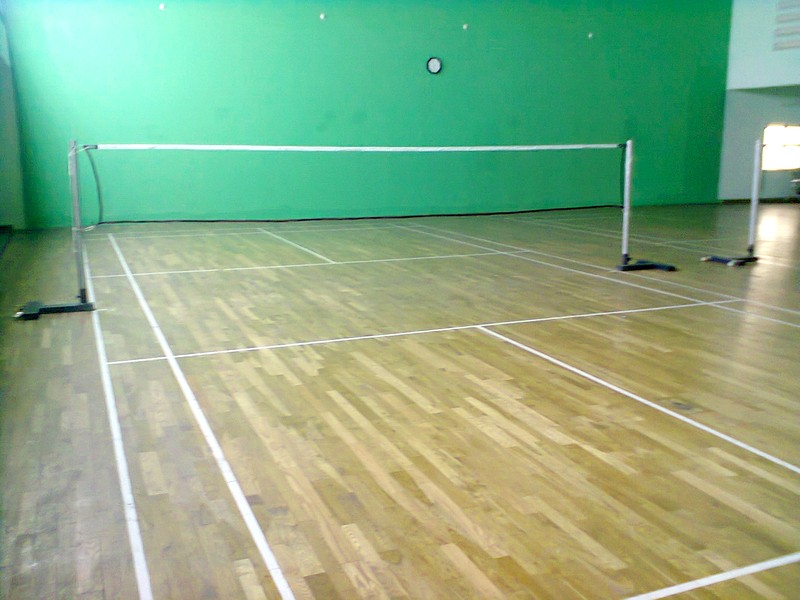 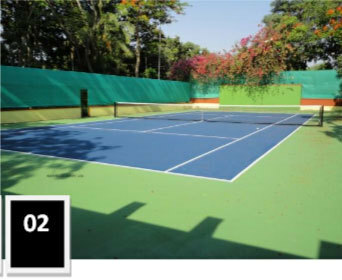 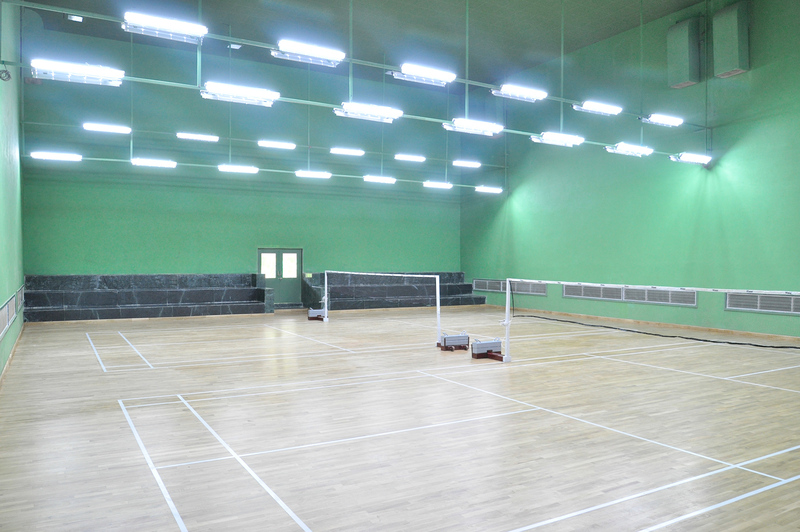 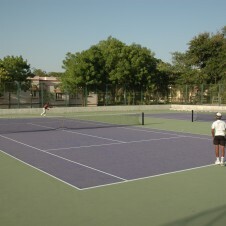 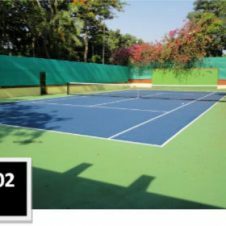 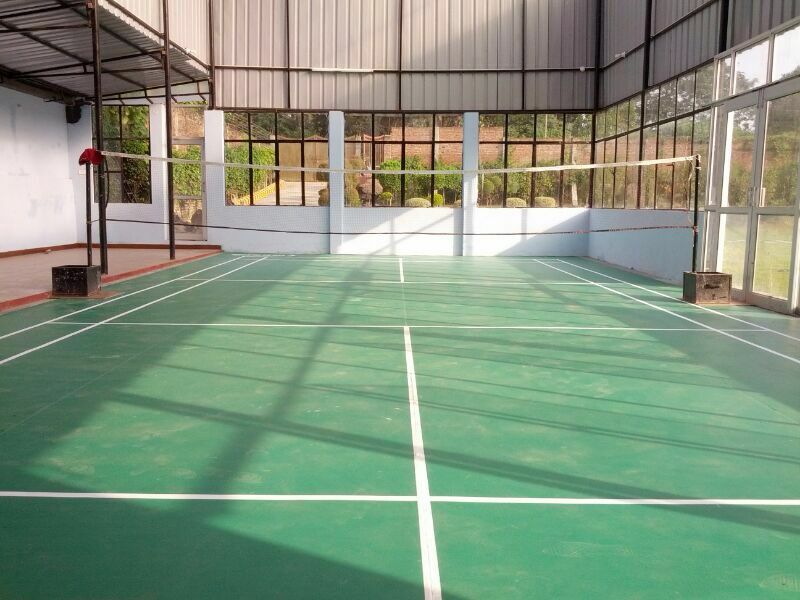 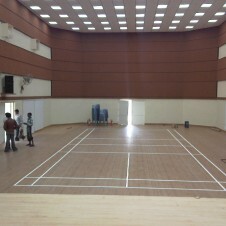 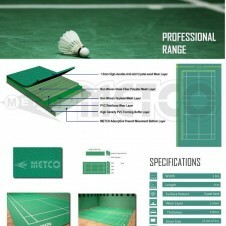 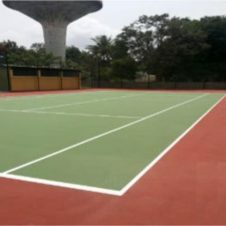 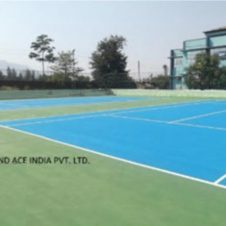 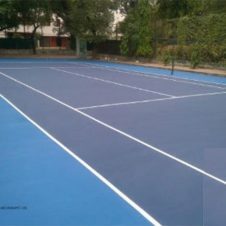 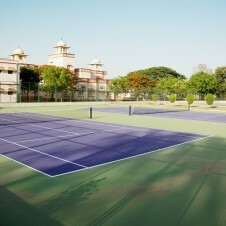 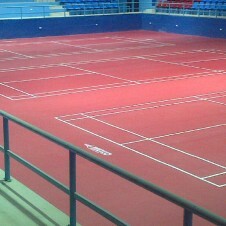 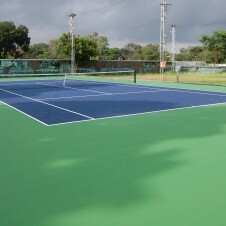 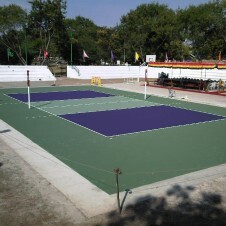 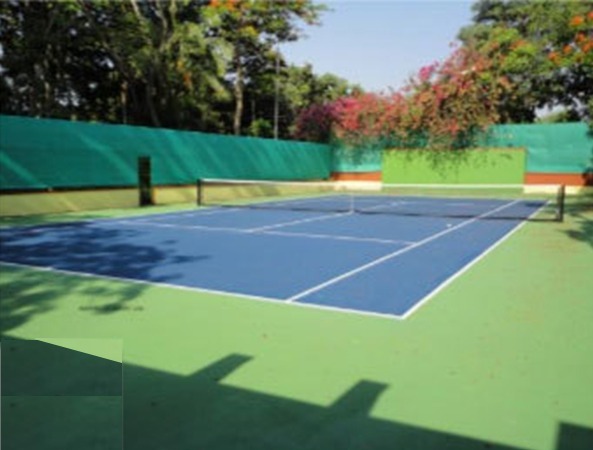 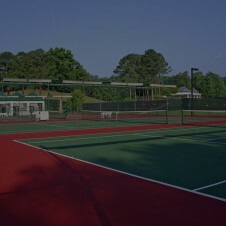 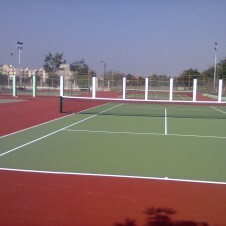 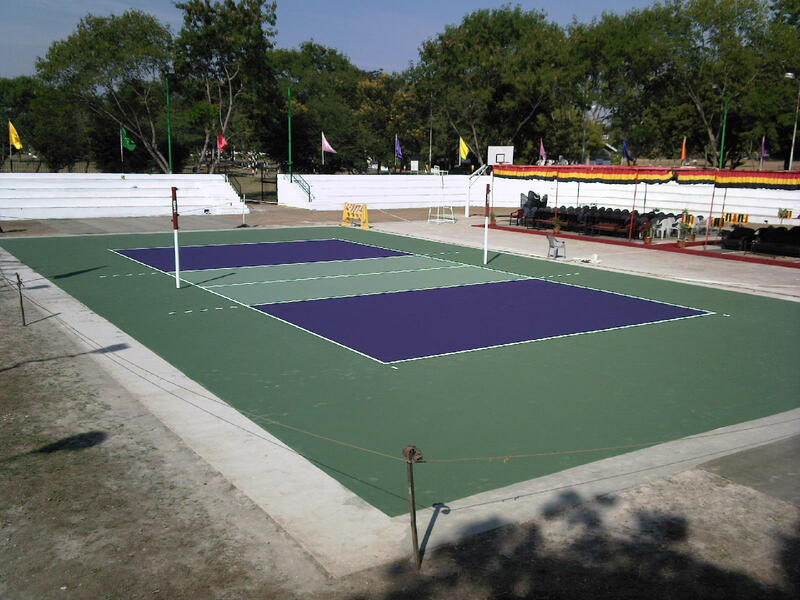 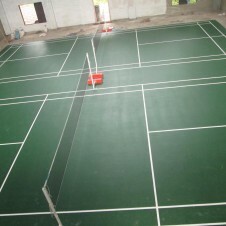 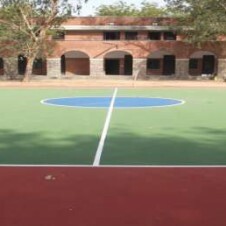 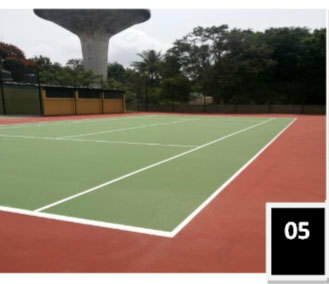 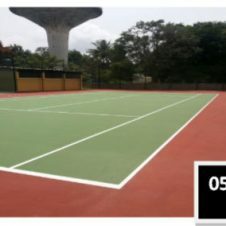 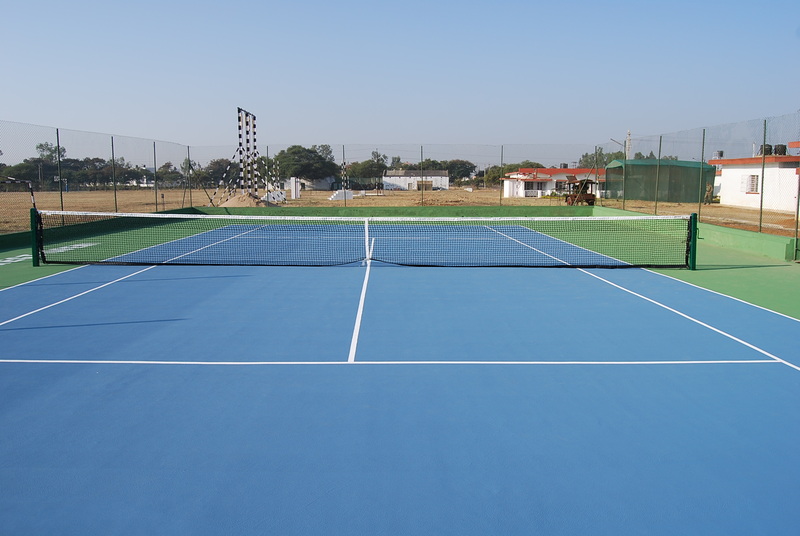 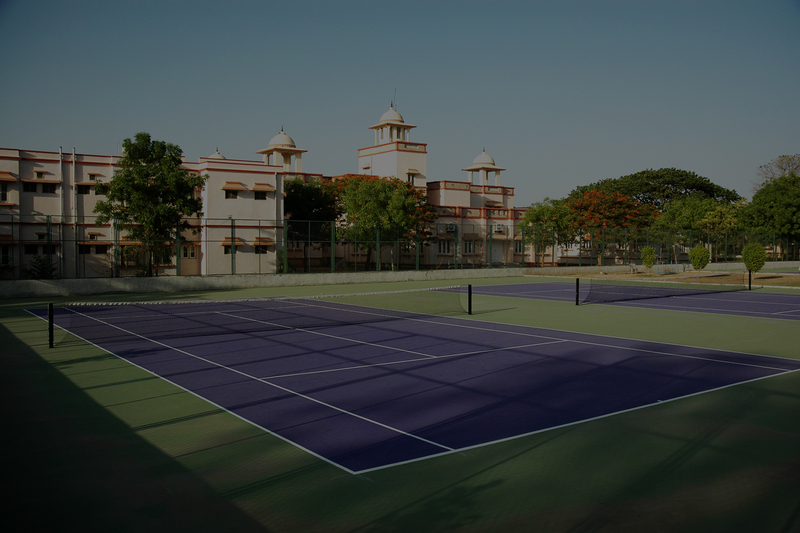 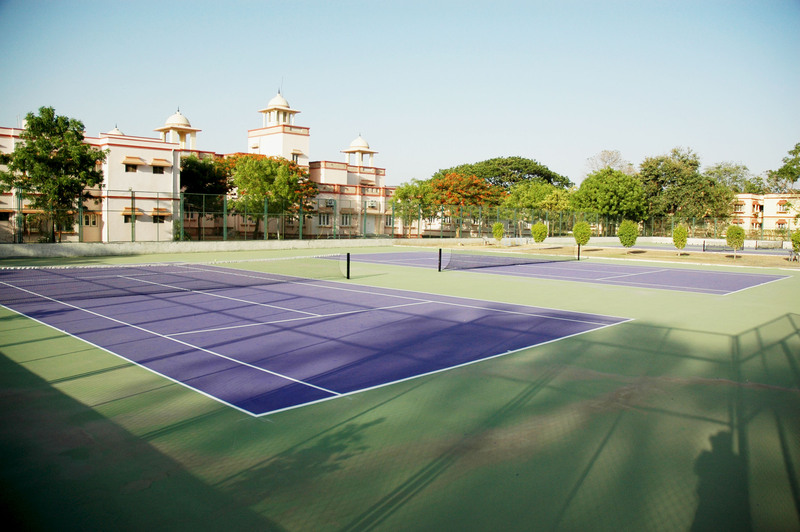 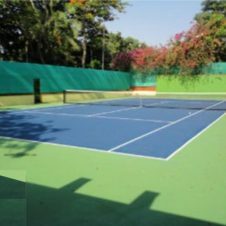 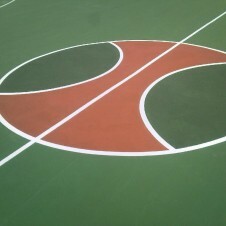 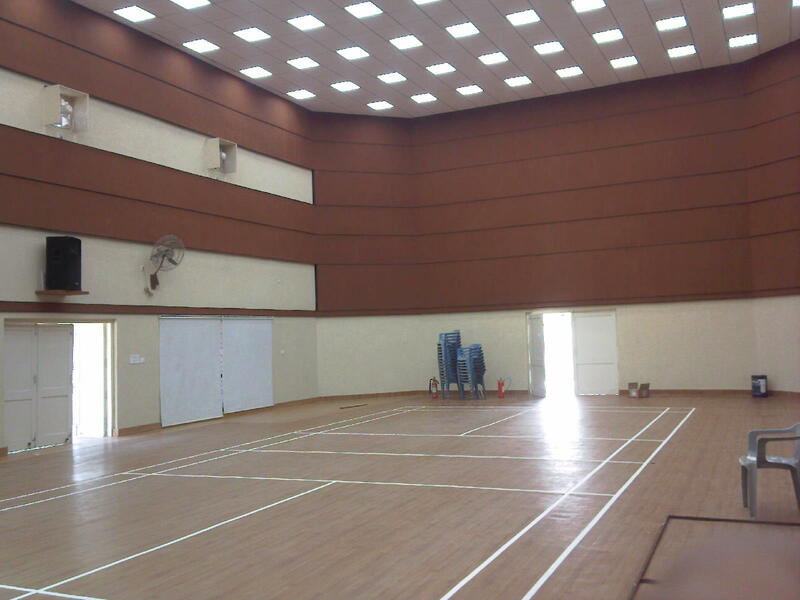 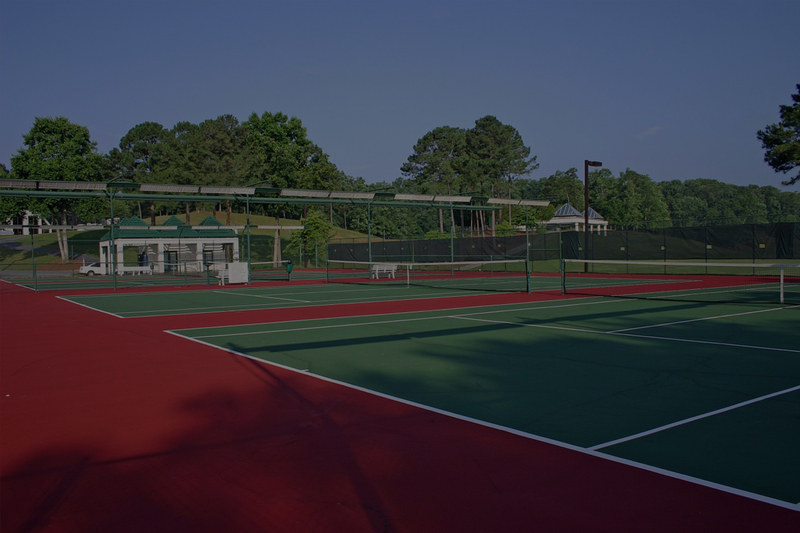 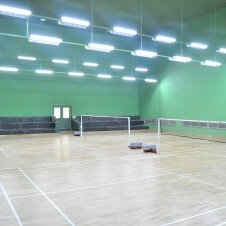 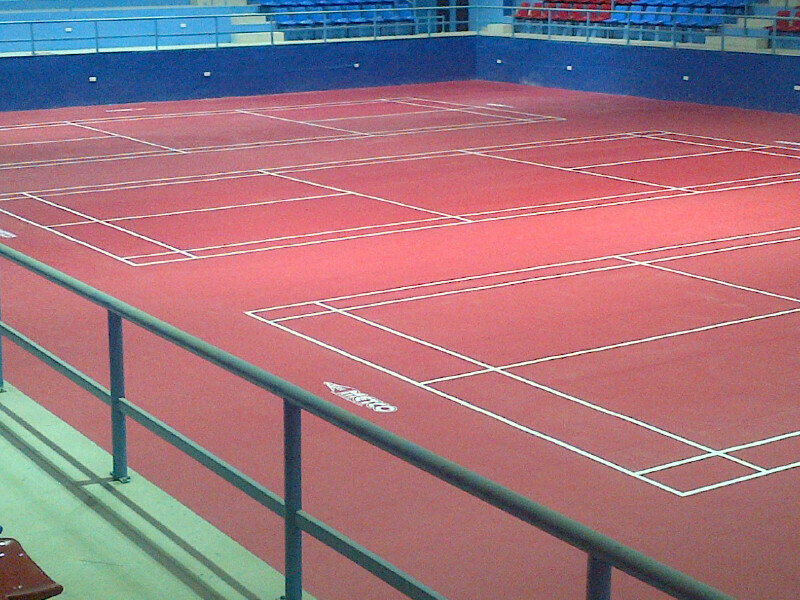 Hard Plaster System gives the finest court surface with unique combination of great strength and whiteness. 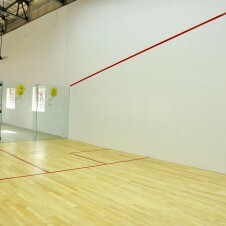 (Hard wall plaster system needs no painting or cleaning to restore it back to its pristine state.) 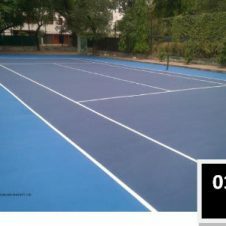 Minimum life expectancy exceeds any plaster product currently available in the world. 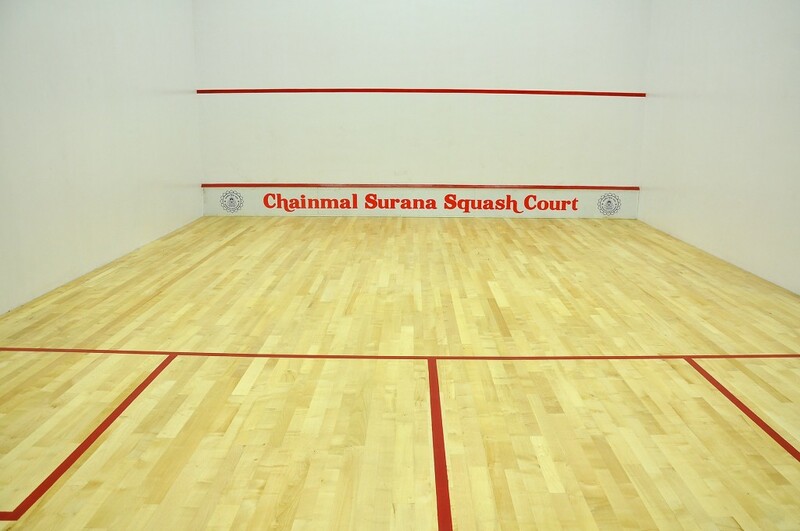 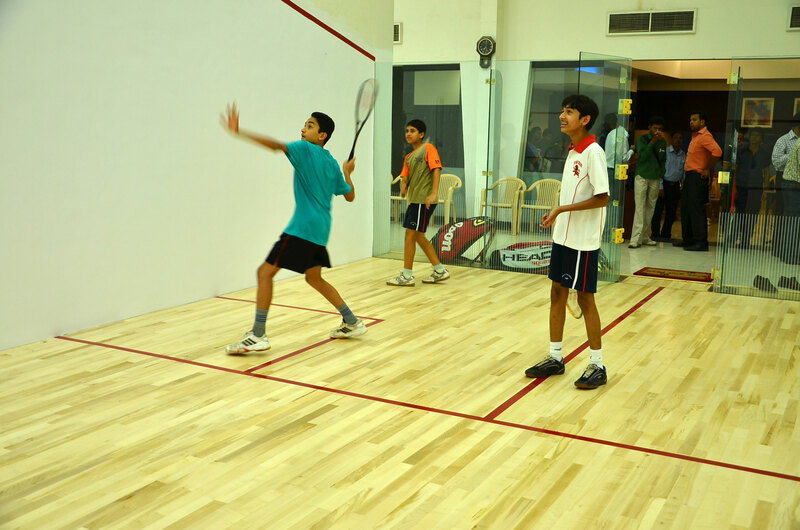 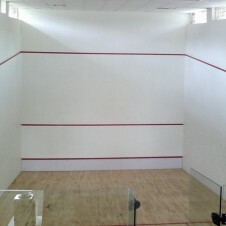 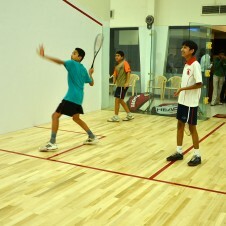 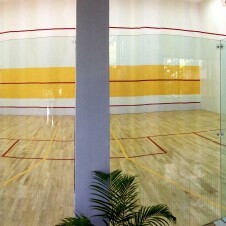 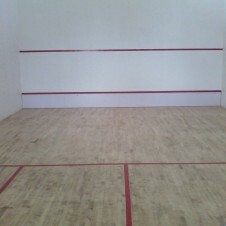 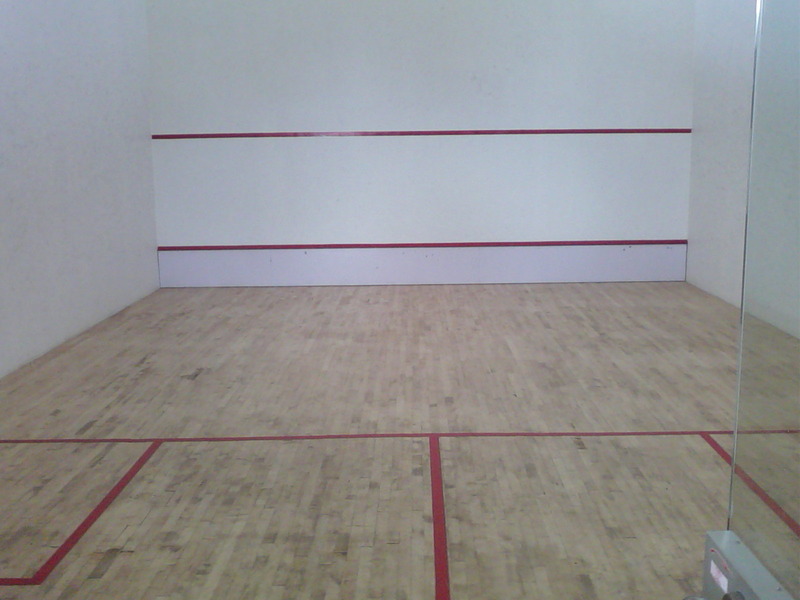 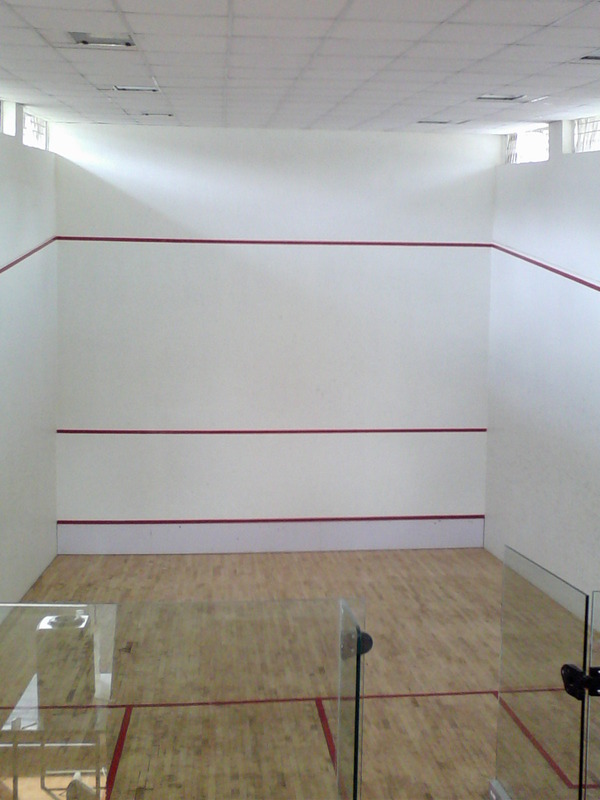 These walls are compliant with all specifications and standards defined by the World Squash Federation. 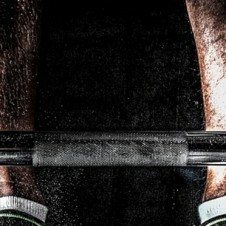 This system has been tried and tested all over the world. 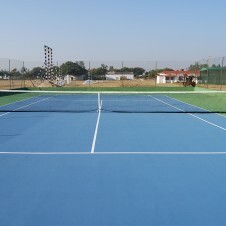 Moreover, it is in use in all kinds of climatic conditions from sub-arctic to desert. 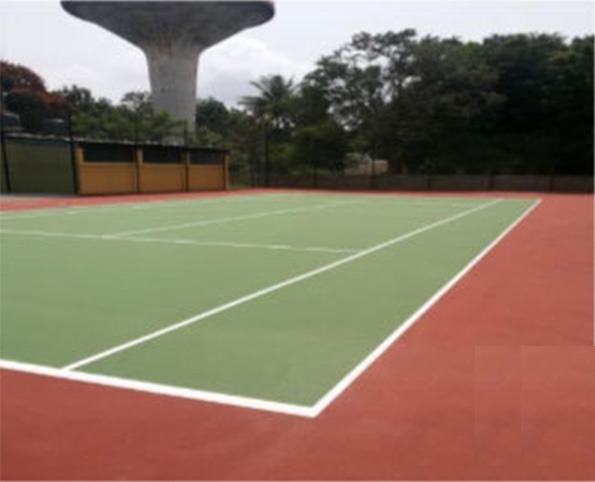 Hard Plaster System have proved for excellent durability for high impact resistance, flat and true predictable rebound surfaces, superb reflectance and ball visibility and cost effectiveness. 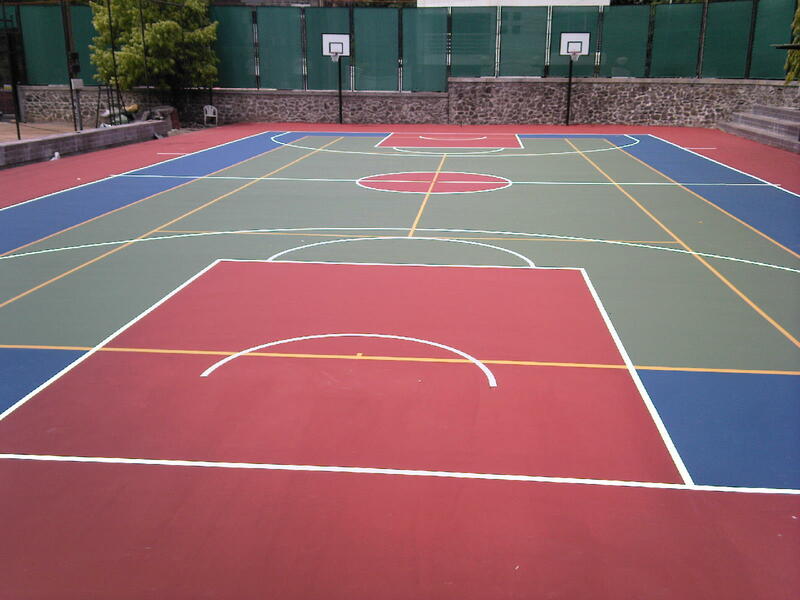 Natural finish or with non-skid polyurethane lacquer. 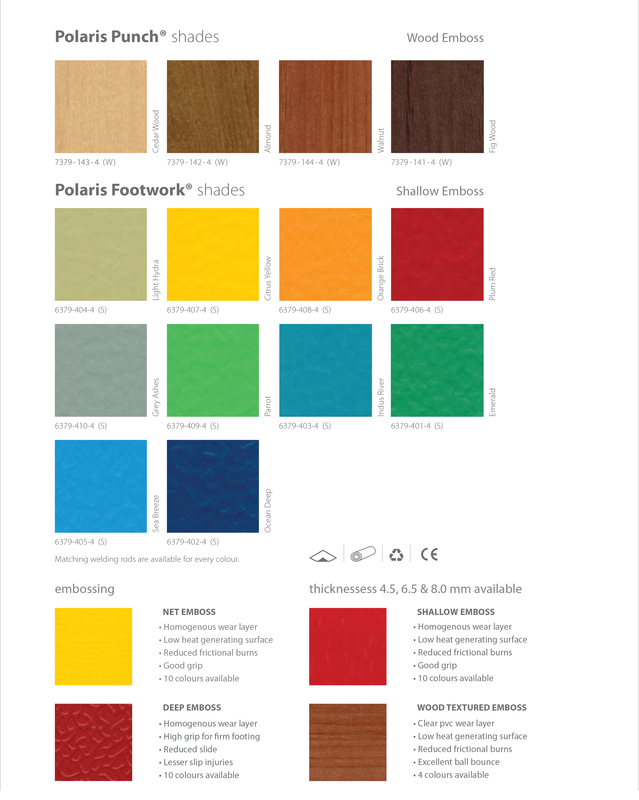 Solid wood all through – no de-lamination as in multi-ply or laminated construction. 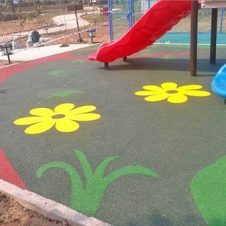 No wear patches in heavy play areas. 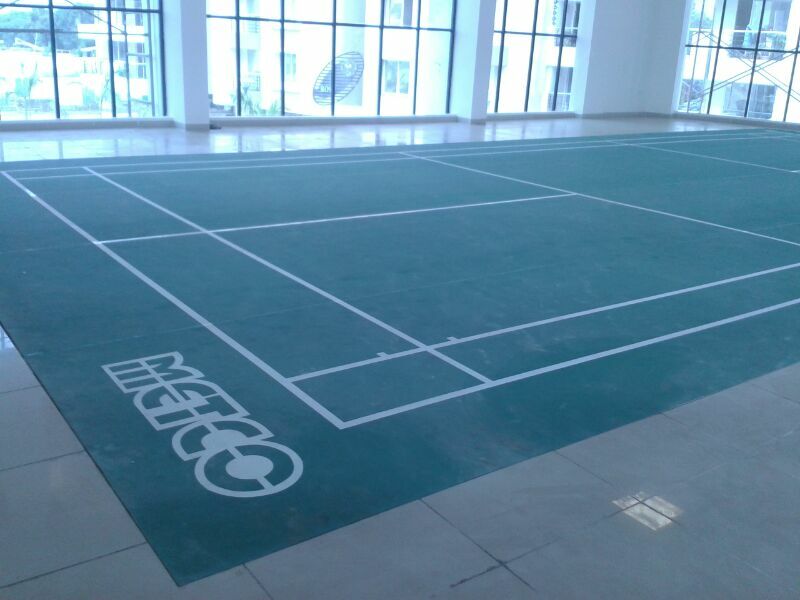 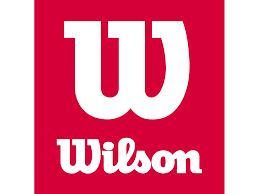 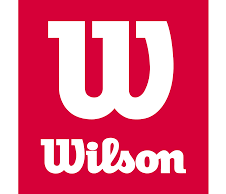 Special cushioning pads to create the perfect flooring for playing comfort.